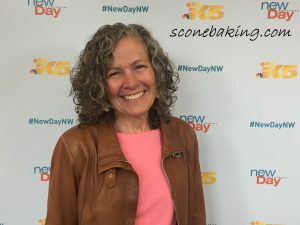 Growing up I always enjoyed going to the Washington State Fair, where every year I’d treat myself to a Caramel Apple from the Marcoe’s Caramel Apple stand. 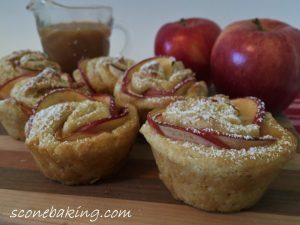 I took that caramel apple idea, and added it to my scone dough to make these beautifully delicious Salted Caramel Apple Roses. Because I bake these in a muffin tin, I wasn’t sure if I should call these scones, muffins or “scoffins”. 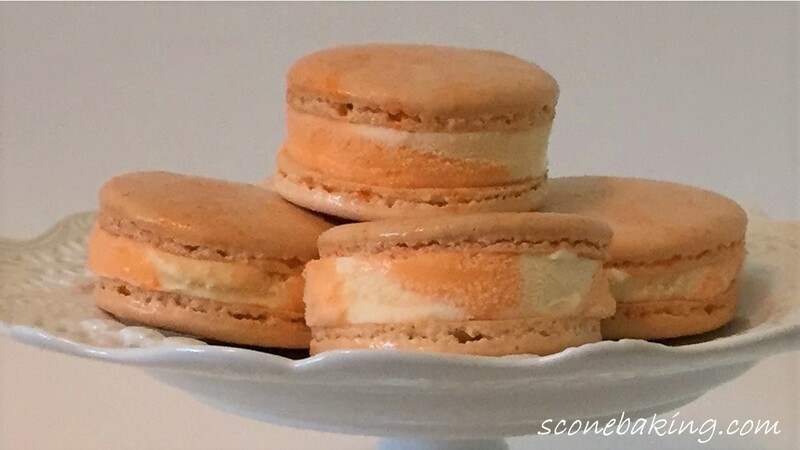 But I know for sure, I can call these “delicious”. To make the scones more beautiful, I decided to make the scone look like a red rose, because I think red roses are beautiful. I didn’t stop there. I then dusted the tops with a little powdered sugar, and a drizzle of salted caramel. 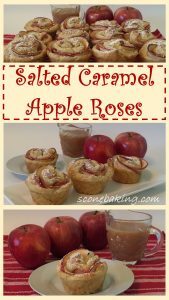 These Salted Caramel Apple Roses are easy to make, yummy, and beautiful. 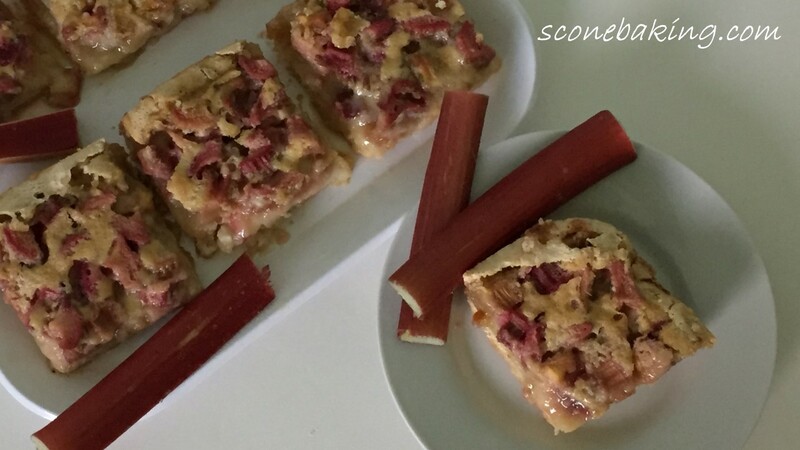 They would make a great addition to your brunch, or just as an anytime snack. In a heavy-bottomed saucepan, combine the sugar and water over medium-low heat until the sugar dissolves. Increase the heat to medium-high, bring to a boil, without stirring. Boil until the syrup is a deep amber color, about 5 to 6 minutes. Remove from heat, carefully pour in the heavy cream (this mixture will bubble), then whisk to combine (mixture will seize if you put the whisk in before the cream, if this happens add 1 Tbsp light corn syrup and stir like crazy until smooth). Stir in unsalted butter and kosher salt. Once cooled, transfer salted caramel sauce to a squeeze bottle. You will use less than half of this sauce for the roses. The sauce will keep in the refrigerator for about 2 weeks. NOTE: The Salted Caramel Sauce can be made a day or so ahead. Cut apples in half, then cut out core, stem end and blossom end. Turn apples cut side down, cut off stem and blossom ends. Cut width direction into 1/16 to 1/8″ slices (very thin), place slices in a bowl of water with the juice of one lemon. Cook in the microwave 1 minute at a time (approx. 1-5 minutes total depending on the thickness of the slices), until apples are pliable, but not overcooked. Drain apples, finish cooling on a plate with a paper towel. Preheat oven to 400º F. Grate butter, put in freezer. Meanwhile, in a large bowl mix together flours, sugar, baking powder, baking soda, salt. Stir in frozen butter. Add buttermilk; mix until just together (do not overmix, the dough is very loose). Place dough on a heavy floured board, pat into a square. Roll out into a 12″ square. Fold into thirds, and then fold into thirds the other direction (you should have a square again). Put on a floured plate; put into freezer uncovered for 5 minutes. Remove dough from freezer, roll dough into 12″ x 18″ rectangle. Cut dough in half the length of the dough, and then in half again the length of the dough. Cut in half the width of the dough, then cut again in half the width (you should have twelve 3″ x 6″ strips). On one strip drizzle some of the Salted Caramel Sauce down the middle, place about 4-5 apple slices along the long edge, overlapping the slices, letting the skin side be outside of the dough. Add another drizzle strip of the Salted Caramel Sauce on the apple slices. Fold the dough in half to cover the apples (except the skin side that extends beyond the dough). 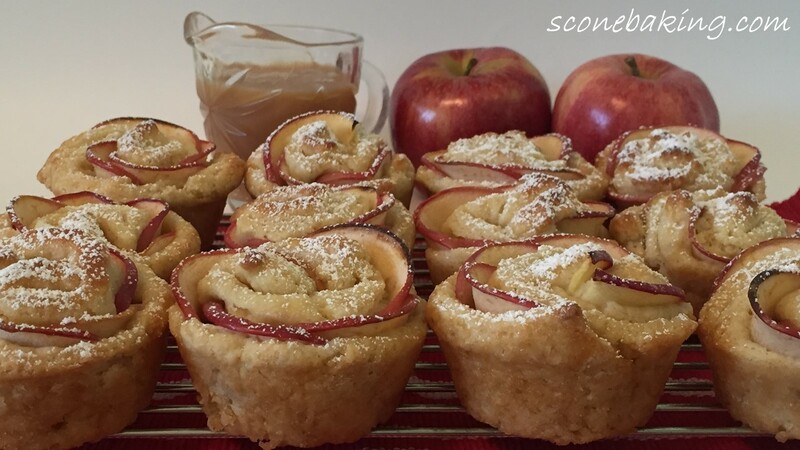 Roll up dough with apples, place in prepared muffin tin. Repeat for each rose. Brush tops with 1 beaten egg. Bake at 400º F. for 20-25 minutes (until golden brown and delicious). Cool on cooling rack. 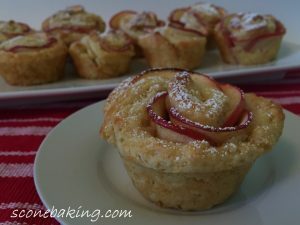 Once Apple Roses are cooled slightly (about 5 minutes), remove from muffin tin; dust with powdered sugar. Serve warm or freeze for later. When serving add a drizzle of the Salted Caramel Sauce on top.